@Pere-U: Haha!! effectivement beaucoup trop de neige! Looks pretty close to maxxis beaver tire....just a little less squarish. One big toothy 52 bash guard...wacth for rocks folks!! 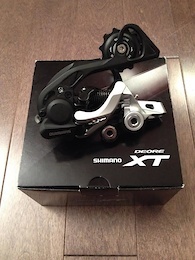 Brand new M786 Shimano XT 10 Speed Rear Derailleur GS cage silver. Got it resently but find out it is the wrong one I bought, as I need the SGS cage version. This derailleur is new as it has been mounted and then took off the bike right away. It has not been ridden at all.